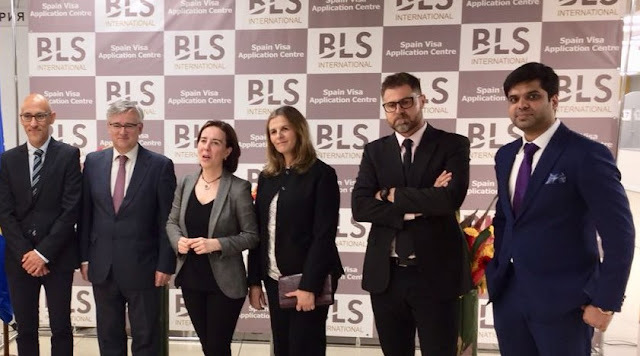 New Delhi, 7th June, 2018: BLS International, a specialist provider of Visa, Passport, Attestation and Citizen Services to the Governments across the world announced the inauguration of their new Spain Visa Application Centre (VACs) in Moscow, Russia on 5th June 2018. Today, the company operates 124 visa application centres in 49 countries for Spain Ministry of Foreign Affairs and Cooperation (Ministerio de Asuntos Exteriores y de Cooperación). The new Spain VAC was formally inaugurated in the presence of the Ambassador of Spain in Russian Federation along with senior officials from BLS International Services Ltd. Guest of honour for the inauguration, His Excellency Ybáñez Ignacio, Ambassador of Spain in Russian Federation commended during his welcome address about the infrastructure of the Spain Visa Application Centre (VAC) and was positive that the commenced Spain visa services by BLS International will be best-in-class in Russia. He expressed his pleasure, appreciating the inclusion of different Value Added Services (VAS) by BLS at the centre like SMS tracking, Premium Lounge, Mobile Biometrics, photocopying, photo booth, travel Insurance and courier services for the convenience of the applicants. Speaking at the opening ceremony, His Excellency said, “BLS International not only fulfilled all the conditions of the competition announced by the Ministry of Foreign Affairs of Spain, but also added new services, surpassing the expectations of the Ministry”. The inauguration was also witnessed by EU delegation in Moscow, Turespana Director Luis Boves Martin and Boris Jelovšek - Minister Plenipotentiary for Embassy of Slovenia amongst other notables. ​​The application center is centrally located and has well trained staff to handle applicants’ queries while the website is user-friendly and informative. It is equipped with state-of-the-art facilities and has the capability to service other Schengen countries jointly with prior approval from Spanish Mission.